Hotel Bisanzio. 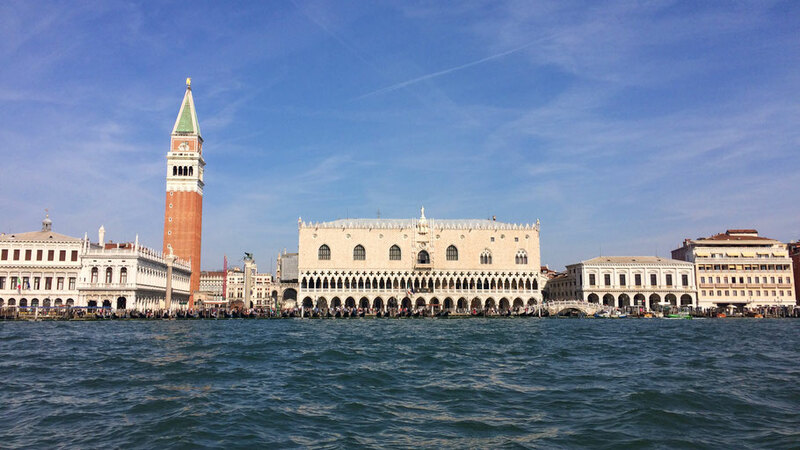 4* hotel close to Piazza San Marco and the Biennale fair grounds. You can book it here. Hotel al Sole. Basic 3* hotel with high ceilings. You can book it here. Foresteria Levi. 3* hotel in the Palazzo Giustinian, located right at the Canal Grande next to Accademia bridge. You can book it here. Hotel Bauer. For a luxurious 5* stay right at the Canal Grande. You can book it here. Ristorante Wildner. Delicious food and fish soup, located right by the water. Antiche Carampane. Close to Rialto bridge and absolutely great sea food. Ai Barbacani. Small restaurant at a small canal with nice appetizers, great fish platters and friendly service. They have a cute two-seater table right at the canal. Hostaria da Franz. Elegant fish restaurant with a very good wine selection. Corte Sconta. A real gem – don‘t miss the seafood appetizer plates! Al Covo. Charming family-owned restaurant close to the Arsenale area. Campo Santo Stefano is a nice and tranquil square close to Accademia. At Ristorante Santo Stefano you can get Pizza, Spaghetti alle vongole and more. On the way between the Biennale locations of Giardini and Arsenale you can find a lot of restaurants and bars on Via Giuseppe Garibaldi. For drinks before dinner: Under the arcades of Campo San Giacomo di Rialto you will find various bars, e.g. Osteria Bancogiro. The pretty square in front of the church Chiesa di San Giovanni Battista in Bragora has a lot of outdoor bars, e.g. Osteria alla Bandiera. For cocktails check out the Oriental Bar at the Hotel Metropole, which is open even late in the night. Teatro La Fenice. If you do not have time to see a play, it is possible to visit the impressive interiors of the building as a tour. Main sights of Venice (beside its beautiful streets, bridges and canals): Basilica San Marco (get there by 11.30h to see it in best light), Doge`s Palace, Rialto bridge (great view on Canal Grande), Bridge of Sighs. Peggy Guggenheim Collection. Peggy Guggenheim‘s former home with her personal collections and a beautiful garden. Palazzo Franchetti. A pretty palazzo by the Canal Grande with changing exhibitions. Palazzo Fortuny. Museum set in an old gothic palazzo and former atelier of artist Mariano Fortuny. Fondazione Prada. Since 2011 the Fondazione in Venice has its headquarter in this old palazzo. Scuola di San Rocco. Confraternity building with impressive ceiling paintings by Jacopo Tintoretto. Cà d Oro. Best known gothic facade at Canal Grande, nowadays a gallery. Venice Biennale. Very recommended to get a guided tour when you visit the exhibitions at Arsenale and Giardini. Scala Contarini del Bovolo, San Marco, 4299. Lovely spiral staircase. Fondaco dei Tedeschi. The former headquarter of the German merchants has been transformed into a luxurious department store by architects from OMA. The roof terrace has a nice view over the Canal Grande. For fans of Italian architect Carlo Scarpa there are two highlights: The store Negozio Olivetti right at San Marco square and the Fondazione Querini Stampalia with its garden. The islands around Venice are also very beautiful, e.g. Murano with its glass museum and San Giorgio Maggiore with its church by Andrea Palladio. To take a water taxi from the airport costs around €100-150 per boat, with a group of people it is a beautiful way to enter Venice. Getting around in Venice usually means on foot or on water. There are comfortable day passes for the water buses known as "vaporetto". Note: When Venetians celebrate the Regatta Storica on the first weekend of September, you cannot use them.